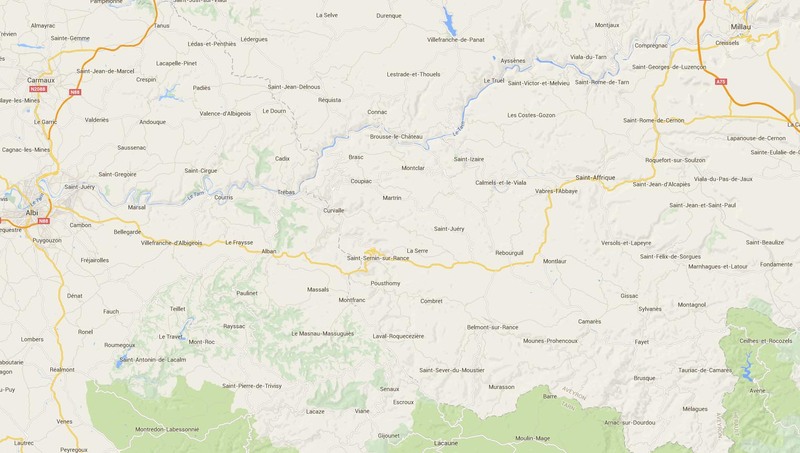 Via Villefranche d’Albigeois/Alban: take the D999 in the direction of Millau. Three kilometres after Alban, turn left onto the D127, then left again onto the D33. Via the Tarn Valley/Ambialet/Trébas: In Saint-Juéry d’Albi, take the D172. In Ambialet turn sharp right and go through the short tunnel. Just afterwards, turn left onto the D77 and left again onto the D700. Continue along the D53. After Trébas, take the D172 and turn right and go across the dam. Turn right onto the D665, continue onto the D555 and turn left onto the D33. From Saint-Affrique, take the D999 in the direction of Albi. After having gone through Saint-Sernin-sur-Rance, turn right onto the D33. From Lacaune, take the D607 in the direction of Albi. After Montfranc, turn right onto the D999 and before arrviving at Saint-Sernin-sur-Rance, turn left onto the D33.